Amerks Shutout the Penguins to Close out November · Let's Go Amerks! The Rochester Americans finished the month of November by shutting out the Wilkes-Barre/Scranton Penguins in a one goal game. Victor Olofsson scored the lone goal and a 35 save game by Scott Wedgewood stole the show to secure the win. It was a close game to the end and the Amerks were able to shut down the Penguins to win on home ice. For a recap of the game from a Wilkes-Barre/Scranton Penguins blogger check out this recap over at Chirps from Center Ice. 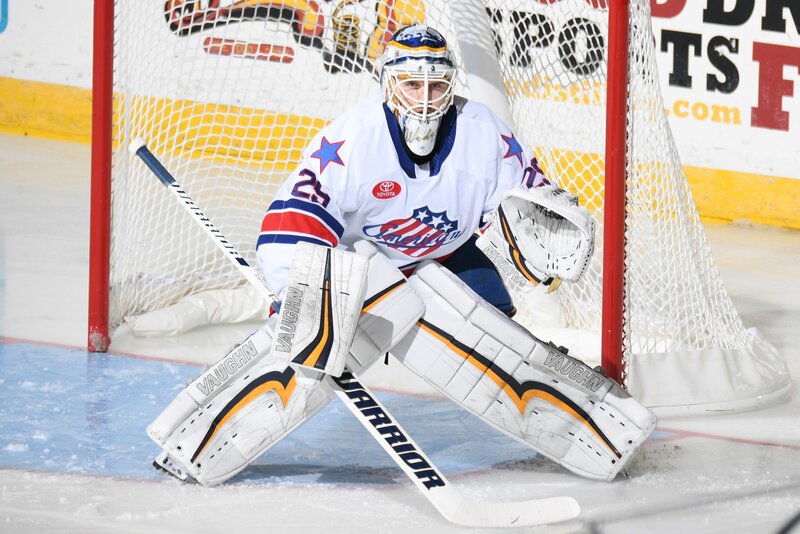 (Rochester, NY) … Scott Wedgewood stopped all 35 shots he faced to pick up his second shutout of the season and Victor Olofsson’s second-period tally proved to be the difference as the first-place Rochester Americans (13-5-2-0) topped the Wilkes-Barre/Scranton Penguins (9-9-3-0) Friday night at The Blue Cross Arena. With the 1-0 victory, the Amerks, who have collected 28 out of a possible 36 points in the last 18 games, maintain their three-point lead atop the AHL’s North Division standings. Wedgewood improved to 8-3-1 on the season by picking up his second shutout of the season. The seventh-year netminder is now tied for third amongst all AHL goalies with eight wins and a pair of shutouts. Olofsson tallied his seventh marker of the season for Rochester, which has won four of the last six get-togethers with Wilkes-Barre/Scranton dating back to the 2016-17 season. The Penguins, who show a 2-5-2-0 record in their last nine contests, were led by forward Ryan Haggerty’s five shots. Former Amerks goaltender John Muse stopped 29 of 30 and was dealt his second loss of the season in his just second appearance of the year. Following a scoreless opening frame which saw a combined for 26 shots between the two teams, the Amerks broke the stalemate nearly four minutes into the second period. As the puck made its way behind the Wilkes-Barre/Scranton net, Danny O’Regan gathered it before centering a pass to Olofsson on the doorstep. The Swedish forward’s initial shot was stopped by Muse before the rebound bounced just beyond the right post. Olofsson then circled the net and made good on the second opportunity at the 3:59 mark of the stanza. O’Regan and Rasmus Asplund were credited with the helpers on Olofsson’s seventh tally of the slate. The Amerks carried the one-goal lead into the intermission despite a 22-20 shot-advantage after 40 minutes. Wilkes-Barre/Scranton seemed to catch a pair of breaks with 6:25 left in regulation as the Amerks were whistled for a delay of game infraction. On the ensuing power-play, Haggerty ripped a one-timer from Will O’Neill that caromed over the glove of Wedgewood before clanging off the crossbar. Haggerty had additional opportunities seconds later, but Wedgewood was again equal to the task. Rochester successfully killed off the infraction, as well as the other three penalties on the night. The Amerks have gone 14-for-16 (87.5 %) in their last four home games dating back to Nov. 7. Wilkes-Barre/Scranton pulled Muse for the extra attacker for the final 1:38, but Wedgewood and company hung on as the Amerks picked up the 1-0 victory. The 1-0 shutout marks the second home blanking on the season. The Amerks return to Floyd L. Maines Veterans Memorial Arena for the second time in as many weeks on Saturday, Dec. 1 as they meet-up with the Binghamton Devils for a North Division showdown in the southern tier. Game time is slated for a 7:05 p.m. start and will be carried live on The Sports Leader AM 950/95.7 FM ESPN Rochester as well as AHLTV.